As there has recently been a rather tactless criticism directed towards us cyclists, it must be permitted for me to bring some modest, if not harmful, proposals for a new traffic etiquette for cyclists and other wheeled persons. Let us begin at the beginning. You set yourself up on the bicycle, have a good look around – first up and down and then from side to side – wherefter you rest for a moment whilst regarding the road ahead and behind. Do this several times and take your time doing it. Therefter you push down on one pedal and up with the other. The bicycle is then propelled into motion. You can, of course, repeat this process, but experienced cyclists rarely need to. You will now find yourself in the so-called traffic, unless you are riding on the island of Saltholm, but we'll assume you're on a busy street. As soon as you've run over the first person you come across you immediately accelerate and try to dash across the intersection while the yellow light is lit. If the light turns red in the process, pretend like nothing happend and continue on – there is nothing easier than pretending like nothing happened. Those who are approaching from the side – whether in a car or on foot – will no doubt let you pass. They will think that it is them who has made a mistake. So ingrained is the bad conscience in all of us. Never cross an intersection when the light is green, as you risk being knocked over by someone running a red light from the other direction. This is very important as it can still cause misunderstandings, court cases and outbursts of anger. Now you continue riding. Let's say you have to turn to the left. Extend your hand – please be careful it can't be seen – to the right. This means that you won't be turning that way. There has been some discussion about this question but as a cyclist you must never doubt. Your entire focus must be on your riding. The use of a bicycle bell is absolutely out-of-date and simply unecessary. The bell can't be heard above the noise and you should therefore only use your bell after midnight – or after you've arrived home. During the day, instead of a bell, you should use different verbal expressions, shouted with a loud, high-pitched voice. It is recommended to acquire a copy of J.F. Braldrelunds ”Dictionary of Danish Swear Words”. It contains more than enough content for this purpose. If you're going from the street into a port leading to a courtyard or similar, always weave through the pedestrians as dramatically as possible. The bell must NOT be used here – remember that! If you use your bell you'll make people jumpy and it will be much more difficult to weave past them. In the courtyard you discard the bicycle as carelessly as possible, in order to give any potential bystanders the impression that you're cool (superior in intelligence). Ensure that the bicycle is placed so that anyone and everyone can trip over it. You'll quickly discover that the person who trips over it will pick it up and place it politely against the wall – usually under a sign that reads: ”Bicycles will be removed”. Regarding bicycle lights, you need not take this question too seriously. Bicycle lights are simply no longer used and are only rarely seen on bicycles. This is generally because the police aren't bothered much if you cycle without lights, as the statistics show. In 1932-1933, on the stretch between Here and There, only one bicycle light was observed. According to the police report it wasn't possible to identify the cyclist – he was riding like a madman. An absurd idea has popped up in the minds of some so-called people who are believed to live inside unexcavated bronze-age burial mounds. Putting a licence plate on bicycles, as well as a hook under the saddle on which to hang a telephone book and a pair of eyeglasses. The thought is incredibly impossible – a licence plate that must host a number like seven million three hundred and thirty thousand, six hundred and forty three would be wide enough to fill City Hall Square, and if you placed the digits vertically the licence plate would rip down the electricity wires. Yes, well, those were my modest proposals for a new traffic etiquette for cyclists. We have, for far too long, been viewed in a negative manner by Mr Motorist and pedestrians – or rather sleepestrians – and I feel that these proposals will please every motorist and sleepestrian – we apparently haven't evolved any further than this in our sorry old world. 1934. 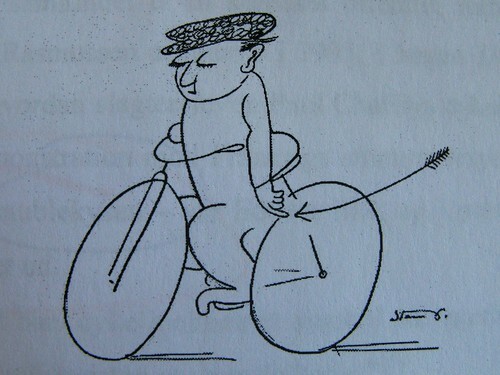 Storm P. was a daily cyclist and he used satire often in all manner of cartoons and commentary about life in Copenhagen, not least about a cycling life. The above text reads a tad old school, but it is clear that some things never change. Not least bicycle 'behaviour'. He takes the piss out of those eternal complainers bitching about 'those cyclists'. They've always been there, even in countries saturated by bicycles. They are even still around if you read the letters to the editor in virtually every Danish newspaper. More now than ever in this current anti-cycling climate in this country. He takes their view to the extreme with this text, taking their generalisations to task and ridiculing them. Much of this sounds familiar today. Cyclists have often been declared outlaws, even when just regular citizens turning right at red lights or rolling across pedestrian crossings at 4 km/h. I love Storm P.'s angle. Some things never change so behavourial campaigns aimed at cyclists are probably a considerable waste of money. Focus instead on tackling the destructive capabilities of the automobile. More on Robert Storm Petersen in Danish and in English. There is also a museum in his honour in Copenhagen.